Businesses have begun to recognize the need for change within the field of training and development. Curriculum designers are now creating learning programs, which reflect the understanding that every employee is unique. Individuals think and learn “differently,” have varying strengths and weaknesses, and may have distinct training preferences. 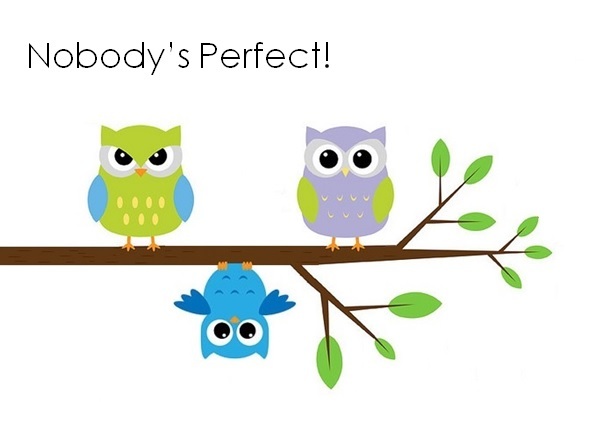 The fact is…a one size fits all approach does not adequately serve all employees. This trend is not surprising, and is long overdue. Special education teachers have been providing accommodations and differentiated instruction for students for many years. While some organizations are now providing a menu of courses (whether online or within a classroom environment) for employees to choose from, and encouraging “blended learning;” they often fail to support, reinforce, or incorporate those lessons within the natural environment and/or within group settings. Unfortunately, despite well intended efforts, the majority of professional classroom instruction continues to reflect its “facilitator’s” personal style and objectives, rather than those of course participants. Some corporate trainers use techniques similar to those practiced by special educators within academic “lesson” plans; however their understanding of special needs, and the science behind the variety of modifications (which can be catered to individual learning differences) is rare. Most corporate trainers are limited in their ability to differentiate instruction for those with special needs. And, in less formal settings, where managers (and co-workers) are responsible for training and coaching others; “mentors” have minimal knowledge as to “how to” teach even the simplest tasks. Special education teachers have been taught to focus on each student’s strengths, interests, and learning style, and have an understanding of the development processes through which all individuals learn and adopt new skills. In fact, research indicates that the techniques, which support students with disabilities, have without a doubt, proven valuable for ALL children. So, one has to wonder why this knowledge has not consistently been carried through to the adult learning environment for use by corporate trainers and career development specialists. Although the material presented to adults is generally more sophisticated; the learning process within which they acquire new skills is similar to that of young students. The techniques teachers have embraced, reflect an understanding of the incremental steps involved in learning, mastering, and generalizing new skills. Employees may face hidden “challenges,” which they have NOT disclosed to their employers. They may even have learning difficulties that have never been addressed (which they themselves may not be aware of, or understand). Trainers cannot assume all adults will verbalize difficulties, learn easily, or generalize skills, as well as their colleagues. Customization of all elements of the training process may be necessary. While a number of professional development programs have evolved to support individual learning differences, they are NOT widespread. And, even when organizations have access to customized training; an inclusion program must be integrated into a comprehensive professional development program in order to ensure its success within team environments. Onboarding Considerations. The Next Generation. The generation entering the workforce is accustomed to receiving accommodations, and being “included.” They will be participating within an environment with people of all ages, many of whom may not be familiar with their (“modern”) disability, or accustomed to their differences. In fact, the majority of senior executives they encounter, will have grown up in a culture described as “separate, but equal;” which is still evident within aspects of society. As a result, these senior professionals are limited in their perception, and ability to effectively communicate with individuals who are not within the “norm”…i.e. AVERAGE. Individuals with lifelong mental disorders are especially vulnerable to criticism and anxiety. It is crucial for trainers to respect the intelligence of each employee, and provide adequate training from the start. Incorporating the techniques used by special educators will increase the success of training programs for ALL employees, just as it has for ALL students within inclusive classroom settings. Remember, The Onboarding Experience Matters To Your Future Employees. Octavius Black and Sebastian Bailey, founders of Mindgym, recognized that the field of learning and development had not kept pace with societal changes. They ambitiously set out as pioneers to “shake things up.” Their mission was to help people use their minds more effectively, so they could get more out of life, and give more to others.” By combining the science of psychology with trends in consumer marketing, they developed a comprehensive program to change the way people think, feel, and behave. Mindgym’s personalized approach to training was developed to appeal to employees’ self-interests. Previous research on learning transfer, and how to make learning and change stick, was integrated into their bite-sized learning management system. The bite-sized revolution in learning: Achieving much more with less. Many of the curriculum techniques Mindgym favors for ensuring employee retention and long term success, run parallel to those which have proven successful for academic success within early childhood and elementary academic environments. 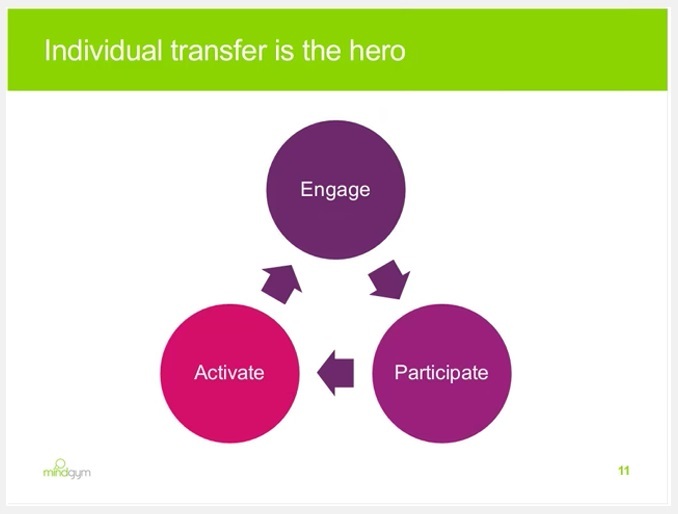 Transfer should be the “hero” – The training event is NOT the hero. For sustained change in behavior – 3 stages are necessary. 1. Engagement – Recognize people are different. Provide choices. Cookie cutter interventions are not individualized, and participants will not feel unique, or excited. In order to scale training programs, companies should embrace interventions, which embody strategies similar to those used by business to consumer marketers. Mass customized standardization can offer unique, and scalable solutions, which are individualized (consider Starbucks) to build levels of engagement. Too many choices will not work. Diagnostic assessment is also necessary for customization. Offer employees different routes, which can be combined to specifically meet each individual’s learning needs. Mass customization builds relevance, increases engagement, and enhances transfer. 2. Deep participation – Allow for informal learning, semi-formal learning, and coaching. 3. Triggering and activation of prior learning. Make sure new habits are used at appropriate times. Make the transfer problem explicit, discuss difficulties, incorporate tasks into the workflow (hands on practice), incorporate management observation, coaching and scaffolding, socialization, after action reviews and feedback, and connect the new skills with accountability. The cycle is not a linear series. More and more of the group becomes engaged over time. Hug the context – help individuals to solve problems in the real world, rather than simply helping them to learn. Get as close to the context of application as possible with simulation, role play, problem solving, etc. Bridge to other contexts to deepen learning. Provide multiple contexts for application of the skill. Broaden the principles. Compare and contrast contexts. Encourage generalization (which can be challenging for employees with Autism Spectrum Disorders, or those who tend to take information literally, or strictly adhere to “rules”). Mindgym recommends using metaphors and storytelling (similar to social stories; often used by Applied Behavior Analysts to support students with special needs). The bite-sized approach delivers improvement for all employees, including those who may fall at the bottom of the curve (or are considered outliers of the group) without compromising success for those at the top of the curve. Unconscious bias can interfere with training. All employees, including those with special needs, and even the training professionals (who assess, develop, implement, and evaluate learning programs), will benefit from curriculum; which encourages them to explore their personal biases. Connect the topic to participants’ interests, activating prior knowledge, and getting employees to focus their attention on the lesson at hand. Explain the purpose of the lesson. Set an “agenda” at the beginning of each session. Include modifications within each lesson plan; including “easier” (less challenging) exercises, and/or alternate activities for participants with “differences,” as well as harder, more challenging adaptations for those requiring additional stimulation to remain engaged throughout the process. Encourage active involvement, as rather than presenting a (passive) lecture. Provide opportunities for independent practice in small groups, medium groups (depending on the number of employees and the purpose of the training) in addition to whole group instruction. Continually assess and record progress before, during, and after each session. Encourage participants to express and discuss the aspects of the training which were most challenging, helpful, and in need of modification for future sessions. Present subsequent training to generalize the skills they have practiced within additional situations and environments. Provide ongoing on the job coaching within the natural environment. Continually acknowledge and encourage progress across all contexts.